Industry-leading research and development, combined with extensive testing ensures that our INTERNAL WATER COOLER SANITISER can be used effectively across a whole spectrum of water coolers. This product is designed to be used on internal machine reservoirs and pipes to ensure a hygienically safe machine. UNIQUE COLOUR INDICATOR — Product contains a unique colour indicator enabling operators to visually see that solution has been drawn through the machine and is sanitising all internal components and confirms product is not present once cleaning is complete, making it much safer and quicker to use. SAFE TO USE — Product breaks down to water and oxygen minimising the health and safety risk to cooler users. MILD DESCALING ACTION — This assists in the reduction of scale on internal water cooler components and reduces the likelihood of machine breakdown. DOSING CONTROL— For high usage operators product is supplied in dosing bottles enabling users to dispense an accurate amount of product each time reducing product wastage and associated costs whilst ensuring the correct amount of sanitiser is used each time. FOOD SAFE & NON TAINTING — Our product contains a food safe and non tainting cleaning and disinfectant agent, making this safe to use on internal water cooler components. 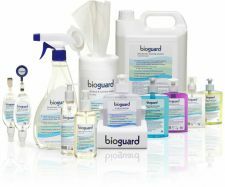 SUPERIOR CLEANING ACTION — Helps eliminate bio-film and dirt and grime build up, improving hygiene and cleanliness of water coolers and improved dispensed water quality. During regular service visits, which should typically be every 2-4months. 25ml of solution per 2 litre reservoir. Please refer to our recommended internal cleaning & hygiene procedure.